Topbox May 2012 had arrived on the exact same day as Glymm did! I don't know if it's because Glymm was faster or that Topbox was just slower, but either way, no complaints here. The delivery packaging has not changed for Topbox. 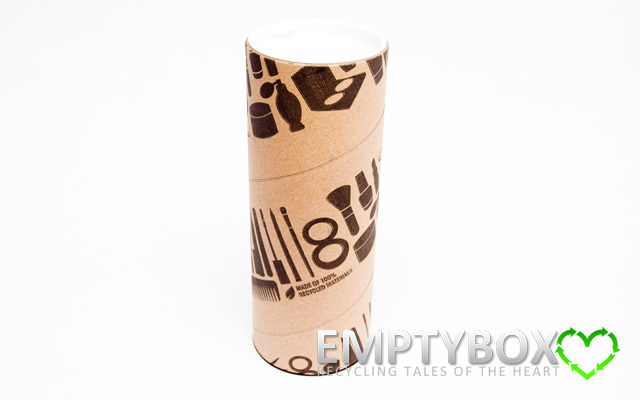 It is still being delivered by CanadaPost with tracking and arrives in the familiar Topbox cylinder tube shape, wrapped up in brown packaging paper. 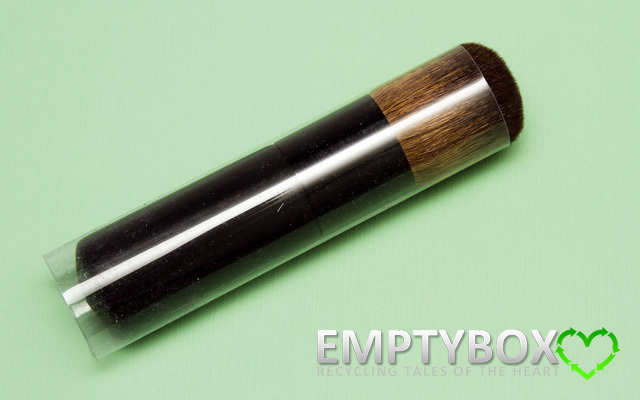 While the Topbox container is still in the signature cylinder tube shape, prior to shipping out the May 2012 Topbox, they had sent an email out to subscribers allowing for the option to request the tube design that you prefer. 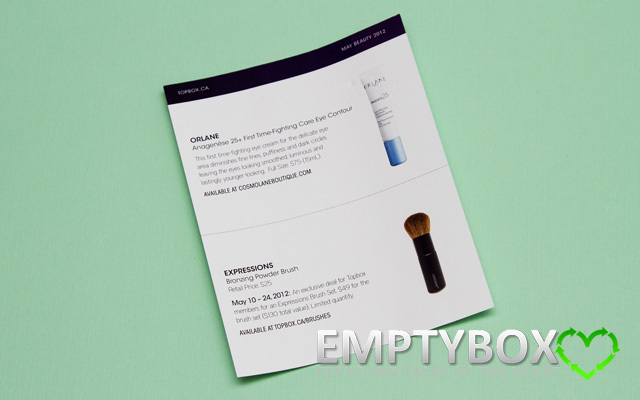 Last month (April 2012), Topbox had featured a more environmentally friendly version packaging instead of their standard packaging (as seen in Topbox March 2012). 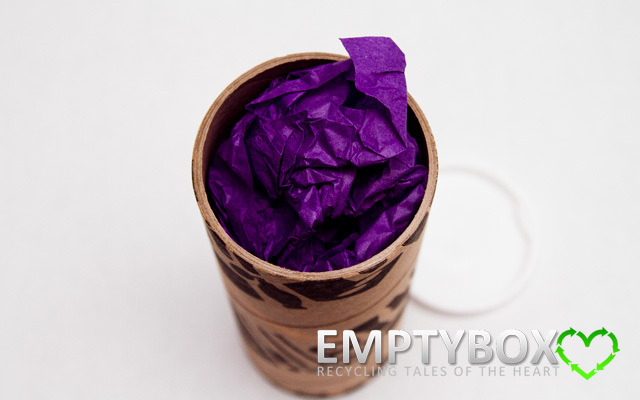 So, you had the choice to choose to receive either the 100% recycled Eco-Topbox packaging or the Original Topbox packaging for the month of May. 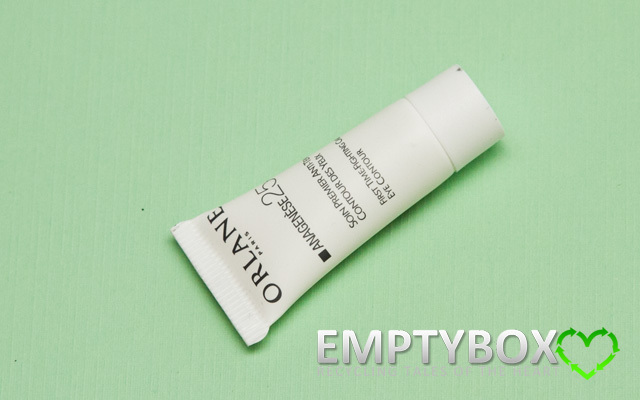 I'm not sure whether this will continue on for each month or Topbox just wants to receive feedback on which box to continue with but I figured since I'm receiving these Topbox tubes on a consistent basis, I could afford to be a little more environmentally friendly. UPDATE: I traded in the Holt Renfrew card and picked up the complimentary Deborah Lippmann Nail File at Holt Renfrew Yorkdale. 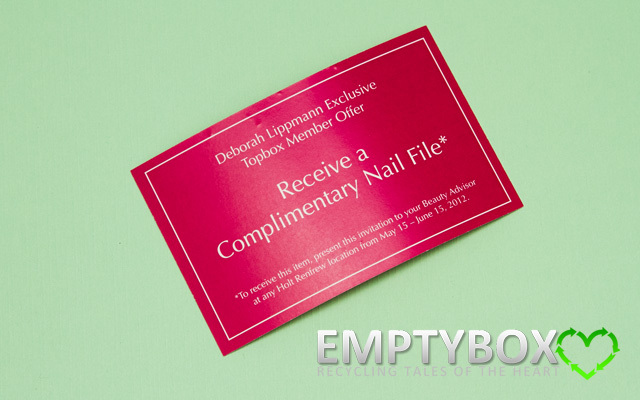 In May's Topbox, you will find an Exclusive invitation from Topbox and Deborah Lippmann to receive a complimentary gift at Holt Renfrew. Please note that there is a Limited Quantity available at each store. This text was accidentally omitted from the card you received. 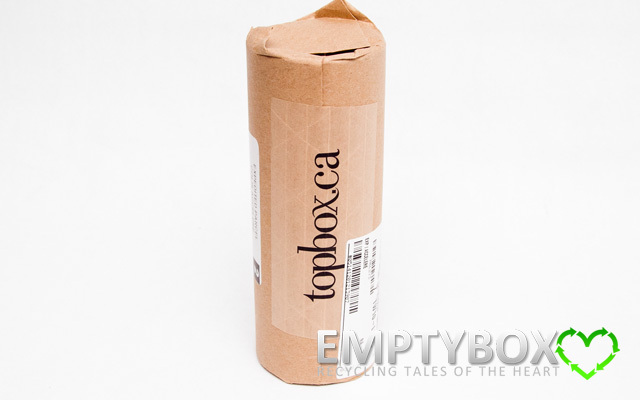 If you have any questions, please feel free to email us at info@topbox.ca. I really LOVE this month's Topbox! The fact that there's 2 awesome full size products makes this May Topbox amazing! 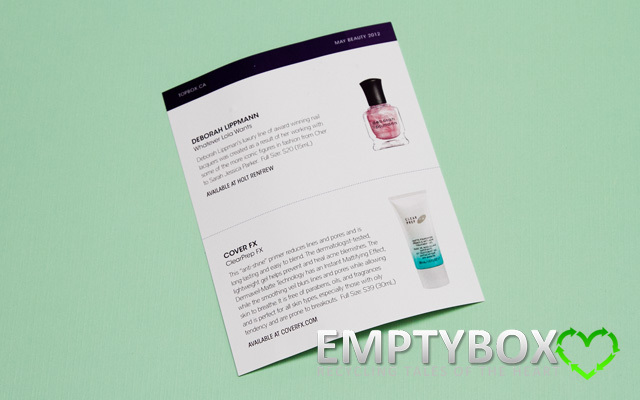 Although Topbox had previously included Deborah Lippmann nail polish in the first box they offered, I totally do NOT mind that they had included the brand for May again. They could include Deborah Lippmann in every single box and I'd be a happy camper! Truthfully, it was because of the Deborah Lippmann nail polish offered in their first box that it enticed me to subscribe to Topbox. The polish colour (Whatever Lola Wants) included in this May box is just gorgeous! I'm actually wearing it right now! It went on smooth and it's holding up very well. 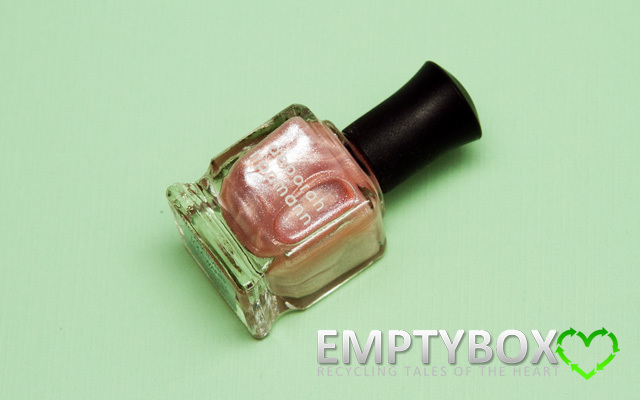 It's very pretty, where it's quite subtle with shimmer. I almost can't tell it's the sassy, sparkling lilac/lavender sheer shimmer colour as described, which is absolutely fine by me. I actually really like the colour since it's neutral enough that it matches with anything and I think it's nice for the summer or any season really. The Expressions brush that was included this month is SO soft! I love brushes and I'm so glad that Topbox included a full size brush instead of just a travel size brush. The more brushes the better! I'm a bit lazy about cleaning them so sometimes I just prefer to buy new ones, which is a really bad habit. I do like trying out different brands for brushes so I'm happy that the Expressions one seems to be pretty good quality from what I can see. 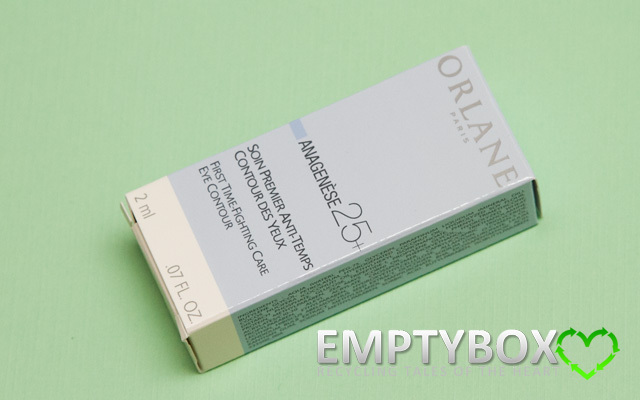 While the Orlane anti-aging eye contour isn't really relevant to my needs at the moment, I'm willing to overlook it since the rest of the box is so great. Anyways, Orlane is a good brand itself, so although it might not be so relevant, it's not something I'd complain about. The Cover FX ClearPrep FX is nice. 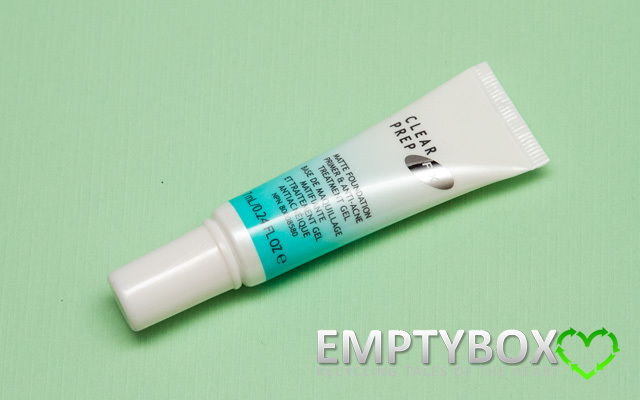 Primers are always good to have and at least it's more useful to me than anti-aging products. As well, I really liked the fact that there was a bonus Deborah Lippmann nail file included in the box, even if you had to go to a Holt Renfrew to pick it up. I go there quite often either way so it wasn't out of the way for me. 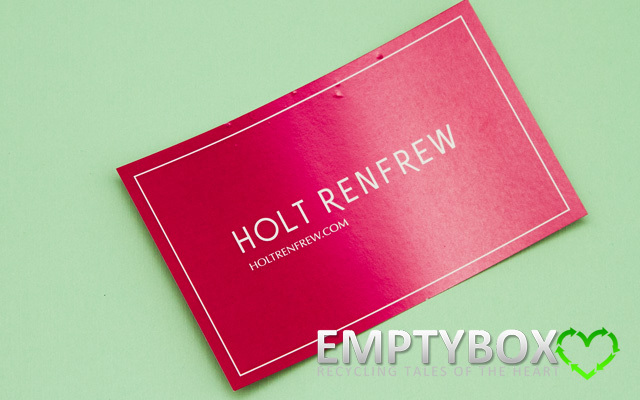 Although for subscribers who do not have a Holt Renfrew conveniently located for them, I can imagine what a pain that would be to have to go out of your way to pick up a nail file. 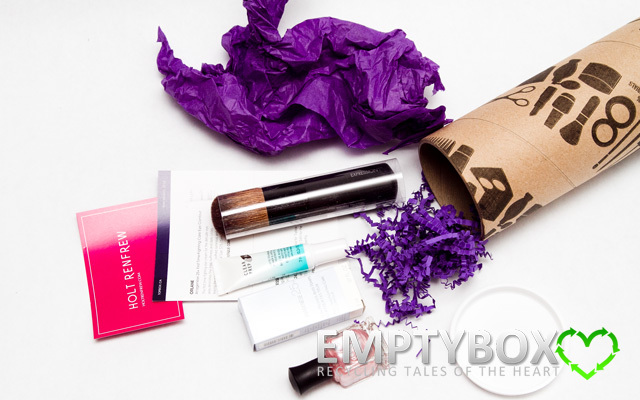 I'm not sure why Topbox, Holt Renfrew and/or Deborah Lippmann did that. 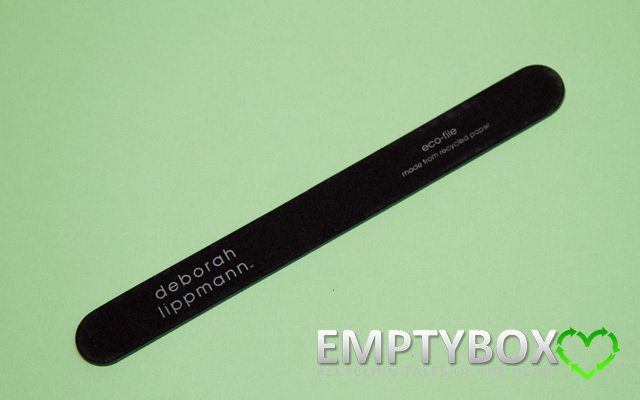 I'm sure the Deborah Lippmann nail file could have fit into the Topbox container tube. The nail file itself isn't super amazing or anything. It's like any normal size emery nail file, just with the Deborah Lippman name on it. No special design on it, just grey with white printing on it. I wonder if it was included as a bonus item because it goes with the Topbox theme of being environmentally friendly since the Deborah Lippman nail file is made from recycled paper.